Until the Duramax-powered Chevy Colorado and GMC Canyon show up (supposedly 2016) the 2014 Ram 1500 EcoDiesel is the smallest diesel pickup you can buy in America, and it's also the most fuel-efficient. Ram is convinced this is What The People Want, and they're about to start building a whole bunch more of them. Ram's announced they're going to increase production of the half-ton EcoDiesel to "20% of the factory's output." All automakers hate revealing how many trucks they sold by configuration (they only disclose full lines; i.e. "Silverado" or "F-Series"). But when the EcoDiesel came out earlier this year, Edmund's estimated Ram had sold 194,000 light-duty trucks in 2013 and that the company was expecting "10 to 15%" of that number to be diesel sales this year. Assuming they built and sold around the same amount of EcoDiesels (they did move 8,000 in the first weekend) we can make a flimsy estimate that they made 25,000 in their first go-around. With the planned production boost by another 38,000-something light-duty Rams, I think an estimate of EcoDiesel production increasing to an annual total of 40,000 might be in the ballpark of alright. 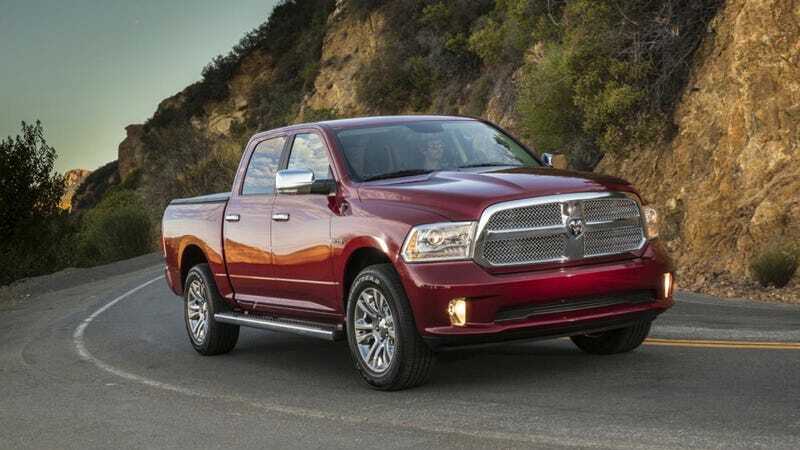 Based purely on highway maximums, the 2014 Ram 1500 EcoDiesel is touted as the "most fuel-efficient half-ton truck" but I reckon they could get away with "most fuel-efficient pickup period." The government certifies it can hit 28 on the highway in 2WD trim, 27 with 4WD (though driving in 2WD) while that Italian oil-burner burps out 240 horsepower and 420 lb.-ft. of torque. Even a 2WD, manual, four-cylinder 2014 Toyota Tacoma is only EPA rated for 25 MPG on the highway. A 2015 Nissan Frontier maxes out at 23 in the same spec. The EcoDiesel, which doesn't get smaller than 229" long, (extended "Quad Cab") is a full two feet bigger than the smallest truck you can buy in America; a 205.5" Frontier, but it's only four inches longer than the biggest Chevy Colorado. And it's still smaller than the four-door three-quarter ton and one-ton trucks that are popular with the towing-and-hauling crowd. Ram says "nearly 60 percent of all Ram 1500 EcoDiesel sales are conquest over competitors," which must have them just licking their lips in a market where brand loyalty sells more trucks than almost anything else.